The image of the old bottle thrown into the sea is so evocative. The chance of anyone finding it is small, and of doing anything about it even less. But it does happen sometimes.. Here is a nice link about messages in bottles. On August 25, 2012, NASA's Voyager 1 spacecraft measured drastic changes in radiation levels, more than 11 billion miles from the Sun. Anomalous cosmic rays, which are cosmic rays trapped in the outer heliosphere, all but vanished, dropping to less than 1 percent of previous amounts. At the same time, galactic cosmic rays – cosmic radiation from outside of the solar system – spiked to levels not seen since Voyager's launch, with intensities as much as twice previous levels. "Within just a few days, the heliospheric intensity of trapped radiation decreased, and the cosmic ray intensity went up as you would expect if it exited the heliosphere," said Bill Webber, professor emeritus of astronomy at New Mexico State University in Las Cruces. He calls this transition boundary the "heliocliff." 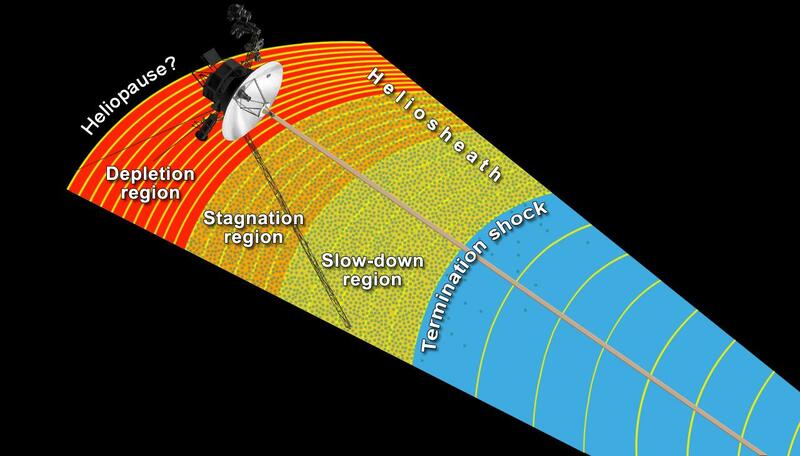 In the GRL article, the authors state: "It appears that [Voyager 1] has exited the main solar modulation region, revealing [hydrogen] and [helium] spectra characteristic of those to be expected in the local interstellar medium." Is there a "galactic wind"? In which case we could postulate that we have entered a transition area, a neutral area for some distance, that is neither influenced by our solar system or the normal most empty regions between star systems or nebula. It could be thick or thin I suppose, where we still have yet to detect the true interstellar realm. What other radiation might be detected after we know we are in the interstellar realm? X-rays? http://www.universetoday.com/100894/ wrote: Scientists Say Voyager 1 Has Left the Solar System, But Has It Really? <<“Within just a few days, the heliospheric intensity of trapped radiation decreased, and the cosmic ray intensity went up as you would expect if it exited the heliosphere,” said Webber in an AGU press release. Webber is a professor emeritus of astronomy at New Mexico State University in Las Cruces. "The Voyager team is aware of reports today that NASA's Voyager 1 has left the solar system," said Edward Stone, Voyager project scientist based at the California Institute of Technology, Pasadena, Calif. "It is the consensus of the Voyager science team that Voyager 1 has not yet left the solar system or reached interstellar space. In December 2012, the Voyager science team reported that Voyager 1 is within a new region called 'the magnetic highway' where energetic particles changed dramatically. A change in the direction of the magnetic field is the last critical indicator of reaching interstellar space and that change of direction has not yet been observed." ScienceShot: Has Voyager 1 Left the Solar System? The articles referenced at http://asterisk.apod.com/viewtopic.php?p=195604#p195604 have all been updated and some titles changed. UT: Scientists Say Voyager 1 Has Left the Solar System, But Has It Really? 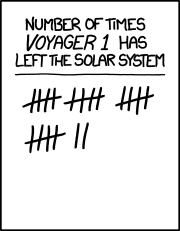 Seems that Voyager 1 has left behind the heliopause. For NASA, the heliopause is the limit of the Solar System. Then, Voyager 1 would already be in interstellar space. Question: In your opinion, what were the most important discoveries of the Voyager space probes? Answer: There are so many. Voyager is probably the most scientifically productive mission ever. It was only the second mission to visit Jupiter and Saturn and the only one to visit Uranus and Neptune. Voyager 1 and 2 obtained the first detailed profiles of the atmospheres of Saturn, Uranus and Neptune and improved our understanding of the characteristics of the atmosphere of Jupiter. The Voyager spacecraft revealed the enormous amount of detail in the rings of Saturn, discovered the rings of Jupiter and provided the first detailed images of the rings of Uranus and Neptune. Voyager imaged Earth's moon and discovered twenty-three new moons at the outer planets. Voyager made significant improvements in the measurements of the magnetospheres at Jupiter and Saturn and provided the first measurements of the magnetospheres at Uranus and Neptune. The significance of the Voyager is the vast amount of new knowledge about our outer solar system it provided and the interest in further exploration it generated. That interest has resulted in the Galileo mission to Jupiter and the Cassini mission to Saturn as well as the discovery of three new satellites at Saturn using Earth-based instruments. Discovery of active volcanism on Io, a satellite of Jupiter, was probably the greatest surprise. It was the first time active volcanoes had been seen on another body in the solar system. It appears that activity on Io affects the entire Jovian system. Does anyone have any non- forum contact with Asterisk member saturno2, who usually posts regularly, especially on this thread? I wrote him a private message ten days ago and it is still in my out box. He usually responds within a day or two and I'm just a little concerned. But he is probably on holiday. MargaritaMc wrote: Does anyone have any non- forum contact with Asterisk member saturno2, who usually posts regularly, especially on this thread? I am here, but I was with problems in Internet of my area. So glad to see you again, saturno2! Anyway you look at it; voyager 1 is "Far Out Man!" Maybe it hit some dark matter. Probably something like 14.50001, 14.49999, 14.50001. 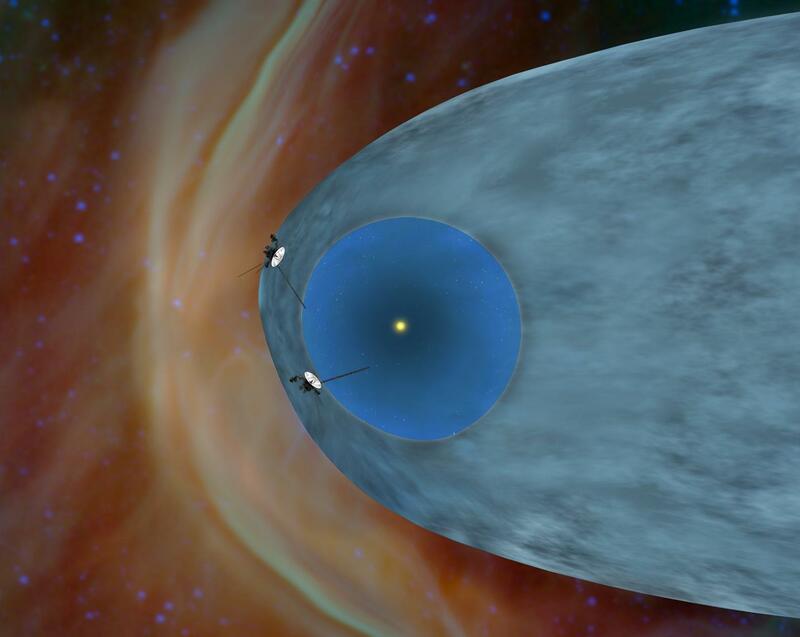 Voyager 1 Explores the "Magnetic Highway"
Thanks for your links. Very interesting. Voyager Mission is very important. Don't worry, the aliens probably speak Turkish! So as long as the instructions to the aliens are in Turkish, the little green critters should be able to read them all right! Unless you count detecting interstellar particles as seeing.